The Procore blog combines serious content and more light-hearted fare. 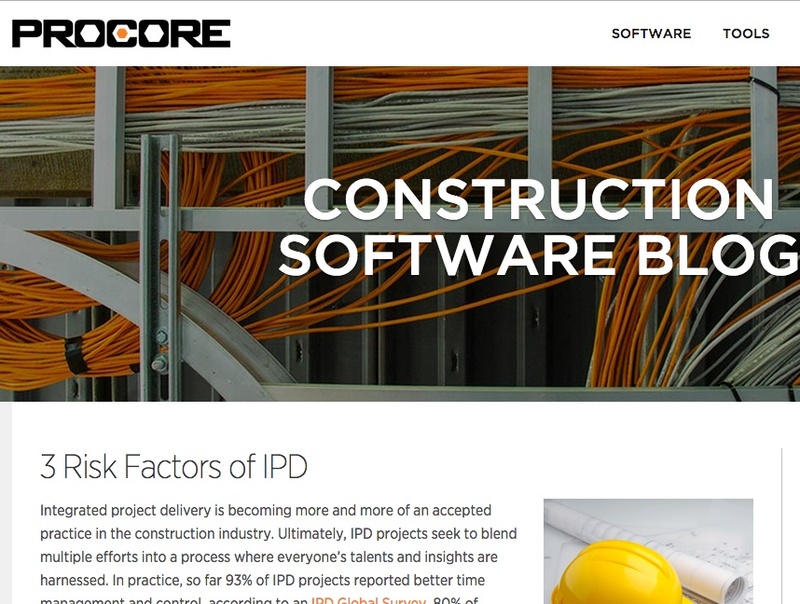 The Procore Construction Software Blog has systematic content built on informative and light-hearted concepts. Regular features, for example, include “Thowback Thursday” and “Screw Loose,” a place for humorous stories. Then there’s the deeply infomative and serious stuff, including, for example, a column: Three risk factors of IPD (Integrated Project Delivery). Participants on all levels get involved in multiple aspects of the project because everyone is working to meet their project goals. Builders, for example, could take on some of the design role if it has been included in their scope of work. If there is licensing necessary for that role then the builder needs to meet the licensing requirements. Often, participants to an IPD project set up a separate entity for the project. A limited liability company, to which all parties are members, will have to meet licensing requirements in its own name. IPD is successful largely because it requires extensive design and planning. During these early stages when all participants are involved, many under-estimate the cost of the project. Participants might not be able to justify the upfront costs on small projects with short durations. During the design and planning stages, IPD projects also require more extensive involvement by senior leadership and legal counsel. Putting together the right internal team could require bringing on new people or training your existing staff. It’s common for IPD contracts to require all involved parties to waive any claims against each other except for willful default. This “no dispute” factor means that professional liability policies are useless, according to Jeff Slivka, Executive Vice President and COO of New Day Underwriting Managers in Hamilton, N.J. In traditional projects, owners file most of the professional liability claims while contractors file about 15% of them, usually against design professionals. There are a few carriers who offer ‘recertification’ or ‘mitigation of damages’ coverage for parties involved in IPD contracts. These coverages would cover your costs to fix design defects or mistakes in professional services when the defects would cause professional liability claims. Third party claims become the responsibility of all parties to the IPD contract and that’s where liability insurance comes in. You have to watch out, however, for exclusionary clauses in these plans such as those excluding joint ventures. IPD contracts are more about the relationships among the participants than they are about activities that have to be completed. And because IPD is still new, there isn’t much case law that you can rely on to evaluate what your rights might be if disputes arise. IPD is not a delivery option for every project, at least not yet. At its core, IPD relies on principles unfamiliar to the AEC sector and so there has to be ample motivation on the owner’s part to pull it off. Then, with buy-in from a well-selected team of participants willing to follow proven practices, success is within reach. But long before that, each participant needs to understand not just the rewards, but the risks as well. Knowing the risks is necessary to accepting them. Certainly, this blog should be on your bookmark list.